Close in but far enough away. Relax under amazing vaulted lanai in serene retreat-like setting. 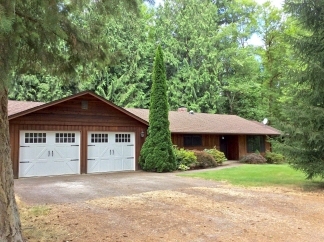 Gorgeous remodeled one-level ranch w/864 SF shop, machine shed & garden on beautiful 5 acres. Many upgraded items: remodeled island kitchen & 2-bathrooms, heatpump-AC, windows, garage drs, laminate floors, pump house, & newer roof. Pullouts in pantry & bath. Greatroom w/huge brick FP & custom mantle, wine fridge. Extremely well-cared for!